DON’T BLINK, is a show designed especially for small groups of people, although it can also be projected in case someone desires to present it to larger audiences. 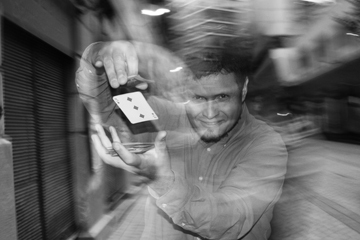 The spectators can observe the illusions within centimeters and they are directly involved in most of the effects. DON’T BLINK is a very intimate magic proposal, enhancing each spectator’s amazement, thus guaranteeing a unique and unforgettable experience. During the whole show, Juan Esteban Varela uses humor and narrative as a resource, in order to make the show a dynamic and entertaining experience and simultaneously amazing. The duration of the show is flexible and can be adjusted to the needs of each presentation, so it can vary from 20 minutes to 1 hour. © 2019 Juan Esteban Varela, powered by Tardis Ltda.